Plus, two more celebs whose new hair colors we want to cop. 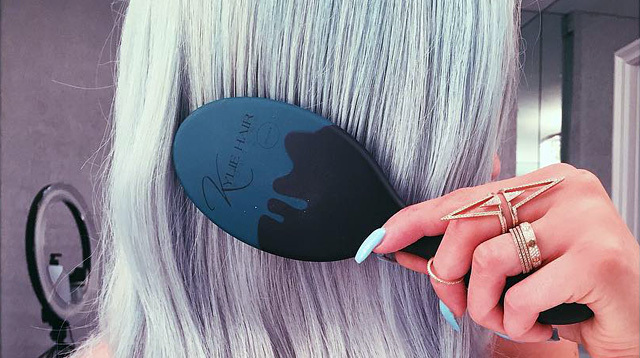 Over the weekend, we were surprised to see that Kylie Jenner’s hair was blue again…kind of. Tokyo Stylez—who works with celebrities like Karrueche Tran and Lil' Kim—was behind Kylie’s extensions and we think the look suits her perfectly; it's more subtle and natural than the aquamarine extensions she had a few months ago. Today, we spotted Kylie back with her signature dark tresses, as she posted this mirror selfie on IG. We guess pastel blue was only fun for a while? In other hair news, Nicole Richie has ditched her pink locks and has gone the platinum blonde route. Seriously, is there a hair color this woman doesn’t look good in?! Not to be forgotten of course is Blake Lively, formerly queen blonde of all blondes. Blake officially debuted what she calls her “bronde”—cross between blonde and brunette—hair last week. With all these drastic hair color changes happening in Hollywood, we’re tempted to dye our own locks soon. Any ideas, CGs?